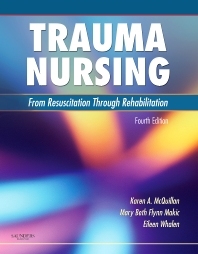 Using the unique cycles of trauma framework, the 4th edition of this classic and highly acclaimed resource is thoroughly updated to bring you comprehensive coverage of cutting-edge research findings and current issues, trends, and controversies in trauma nursing. Detailed information guides you through all phases of care – from preventive care and the time of injury to the resuscitative, operative, critical, intermediate, and rehabilitative stages. Timely discussions on emerging topics such as mass casualty and rural trauma/telemedicine keep you up to date with the latest developments in the field. This practical, evidence-based reference is the most complete resource available for both novice and experienced trauma nurses working in a variety of care settings. Comprehensive coverage includes practical, clinically relevant trauma information for nurses at all levels of knowledge and experience working in a variety of settings. Evidence-based content ensures that you are using the latest and most reliable information available to provide state-of-the-art care for trauma patients. A user-friendly format, logical organization, and helpful tables and illustrations help you find information quickly and clarify key concepts and procedures. Detailed information guides you through all phases of care – from preventive care and the time of injury to the resuscitative, operative, critical, intermediate, and rehabilitative stages. Special populations coverage prepares you to meet the unique needs of pregnant, pediatric, and elderly patients, as well as bariatric patients, burn victims, patients with substance abuse issues, and organ and tissue donors. A section on Clinical Management Concepts gives you a solid understanding of key issues affecting all patients regardless of their injury, including mechanism of injury, traumatic shock, patient/family psychosocial responses to trauma, pain management, wound healing, and nutrition.